It’s really important to learn good technique as early as possible on the drum kit. If you learn bad habits they can be difficult to ‘unlearn’ later down the line. Before we even look at the drum kit let’s talk a little bit about sitting comfortably and good posture. Now, everyone is different and I’m a great believer in sitting whichever way you find comfortable, so these are just a few tips to help you get started. Remember nothing should ever feel strained or uncomfortable while playing the drums – it’s your drum kit and your body – shape the kit to your body rather than your body to the kit! Let’s start with getting the drum stool, or throne, at a comfortable height. Remember there’s no right and wrong here – some drummers play with their stool really low down, some play with it really high up. We’ve got to start somewhere though! Sit on your drum stool with your feet flat on the floor and your legs in a relaxed, slightly apart position. You should find when your legs are relaxed they will naturally be slightly apart anyway. Adjust the height of the stool so your thighs are sloped very slightly downwards while your shins are vertical – so your ankles should be pretty much directly under your knees. While playing drums you want to stay as floppy as possible – that applies to pretty much every part of your body… apart from your back! If you slouch you’ll probably be too low down and your breathing may be impeded since your diaphragm will be squashed. Sit up nice and straight and maintain good posture throughout your time behind the kit. Check yourself every now and then to make sure you haven’t started slouching – it’s a bad habit to get in to. Sit up nice and straight – keep everything else floppy. OK, you’re about ready to actually get behind the kit now. If you haven’t already set up your kit properly read this page and watch the video. 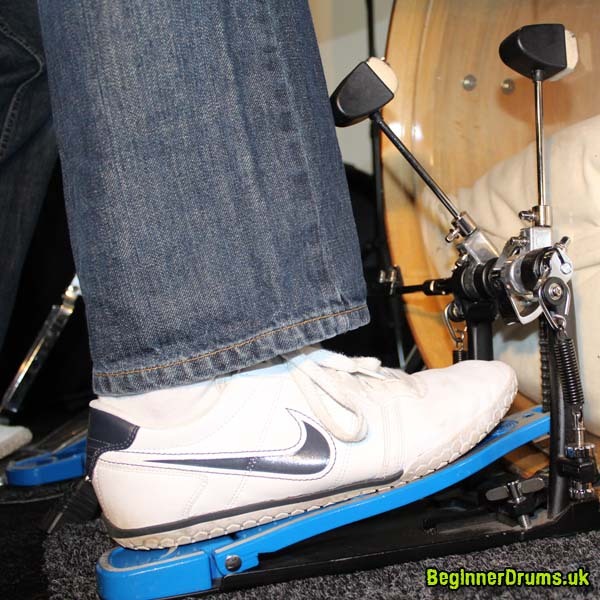 Assuming you’re playing on a right-handed kit, you’re going to put your left foot on the hi-hat pedal and your right foot on the bass drum pedal. Position your foot so that your heel is at the base of the pedal – it should feel comfortable to push the pedal down without lifting your foot – i.e. your ankle is the fulcrum point. You’re not always going to play with your ankle as the fulcrum (heel down) but it’s a good starting point. All the while your shin should be pointing straight downwards (ankle under knee). You want as much force as possible from your upper leg to go straight downwards and in to the pedal. 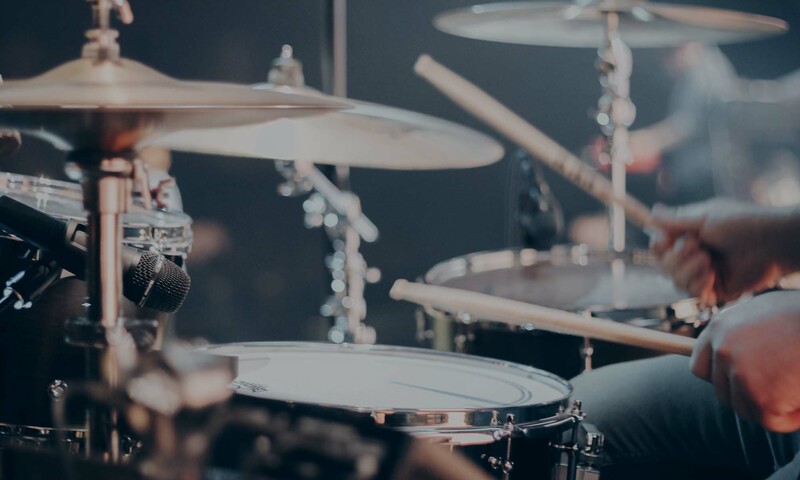 If you’re sitting too far back then your going to end up putting force diagonally forwards – not only is this inefficient but it will result in the bass drum moving forwards while you’re playing. 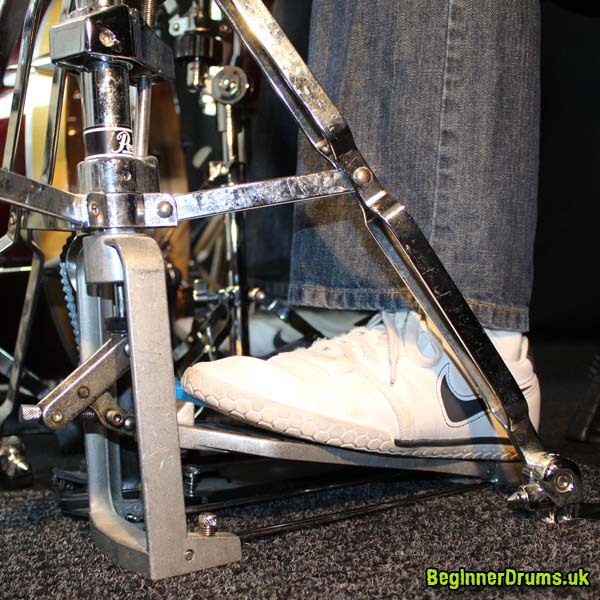 Get used to operating the hi-hat pedal and bass drum pedal to develop a feel for them. They should press down easily and rebound quickly – so make sure the springs aren’t too tight or too loose. If the springs are too tight you’ll find the pedals hard to depress. If the springs are too loose you’ll find they don’t rebound back to their original position properly. There are essentially two main ways of operating the pedals. Heel Down (as described above) or Heel Up. When you first start playing the drums I would suggest you start heel down and get used to operating the pedals using your ankle as the fulcrum. However, some drummers do naturally switch straight to Heel Up playing. If that’s you, fine. You’ll ultimately need to learn both. Heel down playing gives you more finesse and control. Heel up gives you more power and speed. Give some Heel Up playing a try, just so you know what it feels like. Lift your heels off the pedal and you’ll find all of the power now comes from your upper leg. You might need to work on your core muscles if you feel like you’re going to fall off your stool. You can steady yourself by holding a couple of the drums with your hands until you get used to the balance required for Heel Up playing. It can be tricky, but as I say some drummers prefer it from the outset and that’s fine. If you want to keep life simple let’s stick to Heel Down playing for now.